I have just returned from a trip, which included a stay in New York City. On our ride from the airport to the hotel in midtown, we looked out across the river at the majestic New York skyline. The Empire State Building, standing tall and proud punctuated the sunset of bright pinks, oranges and grays, its upper stories bathed in red, white and blue lights. To the far right, in the financial district, a gaping hole, evidence of the destroyed World Trade twin towers. As we pointed out the WTC area a hush fell over us, a usually joking and laughing group. It was an especially sobering experience for me, a native transplanted to the south. When I was informed of this trip I told my wife I was going to go to Ground Zero to pay my respects and pray for those who were killed, also, to give thanks for all the heroes who were and are still at this site of horrific devastation. On my way to the office I met a co-worker. As the conversation turned to; “Where are you going?” I said,New York City, and that I was going to Ground Zero. Our short conversation ended with him asking me to ‘shed a tear’ for him. 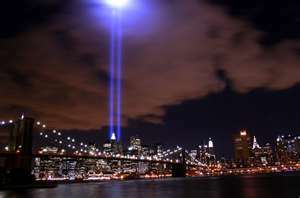 My friend, I shed many a tear at Ground Zero, as am I in writing this story. When we arrived at our hotel each of us went out on our own. We were to meet the next morning to go to Ground Zero. Slowly walking down 8th Ave., I felt a difference in this city that never sleeps. The aura of this city was not the same I knew as a boy or adult. A clear and heavy hand reached down and touched my soul that evening. Continuing my evening walk, the street and sidewalks were empty, I paused at a restaurant with a lighted sign at the door stating dinner specials, at the bottom in large writing it read, “Donations accepted here for WTC fund,” underneath it was a pink heart, I wiped away my tears. Yes, this city had changed at the very depths of its being. Standing at the corner of 8th and 50th I phoned my wife to share with her my evening experiences and the dramatic change in the aura of this great city. The next morning we took the A train to Canal St. As we walked up the stairs to street level the faint odor of smoke grew stronger. We passed a dirty red brick building, a two-story handmade sign hung from the windows, it read, “I LOVE NY & HEROES,” a chill ran up and down my spine. As we walked, each block taking us closer, the odor of smoke intensified. The sight of ashes on windows and buildings was now obvious. Walking around City Hall droplets of ash and water fell upon us from the window washing crews. Blown out windows, tarps on the sides of buildings, security personnel in greater numbers; the outer edge of a war zone. Down to Wall St. As we continued our walk, the strong odor of smoke assualted our nostrils, ash covered buildings filled our line of sight. Our first sight of Ground Zero was minimal. The more we walked, the more we saw. A clothing store with a half-open door still had clothes on the display racks from September 11th layered in a beige ash. Windows, which once displayed glittering jewelry held black velvet covered in the ashes of death and senseless destruction. I was oblivious to my co-workers, the crowd and the noise. All I could say was, “Oh my God,” as we walked the fenced perimeter. Workers filed in and out of this secured area. A haggard firefighter walked by, wiping dust from his brow. Numbed by what I saw I could not believe the vast destruction. My mind and emotions were overwhelmed. We passed fences with posters, pictures, flowers and prayers attached to them, candles flickering in the morning breeze on the sidewalks with prayer cards at their bases, all along the fenced off areas. Standing at a barricade I leaned forward watching our flag proudly wave in the wind over the rubble that was once the WTC, tears began to flow. I prayed for all. Phoning my wife at work I told her I was at Ground Zero watching the cranes remove twisted steel and concrete. To my right the remnant of a building, steel beams twisted and misshapen. Tears flowed. I told her I’d call her back. My sobbing was uncontrollable. There was a large bronze memorial statue by our hotel, dedicated to all the rescue workers. It portrayed an exhausted firefighter down on one knee. Candles, flowers and prayers covered the platform. My eyes filled, I blinked back my tears. 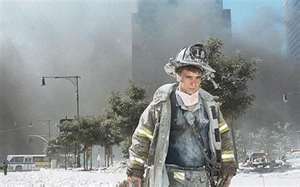 Unkown to me at the time my cousin, a firefighter in midtown, died trying to get people out of the towers.